While the media frequently laments that millennials are killing mayonnaise, the Boomers can be credited with banding together to hand Trump the presidency. After all, older wealthy whites already have their universal health care (Medicare) and their universal basic income (Social Security). Climate change will never have a chance touch them. And the low-income folks who might be voting for progressives have already been killed by capitalism. Knowing this, it should come as no surprise that most senior citizens are no fans of the radical progressive policies which will be necessary to revitalize America once we’ve wrested power away from the ghouls who currently control our destiny. There is a glimmer of hope -- and it comes from young people. We recently ask the American public what they thought of an unabashedly progressive agenda and found that not only is there a generational divide around issues of racial and economic justice, but that the rising generations Americans are committed across the board to these issues. Over several projects focused on identifying the public’s openness to a progressive agenda, we have consistently found that young people are committed to the type ambitious, maximalist policies which have been absent in American politics for our living memory. In our national poll on progressive priorities with YouGov Blue, we found net support for four radical policy proposals among young voters. 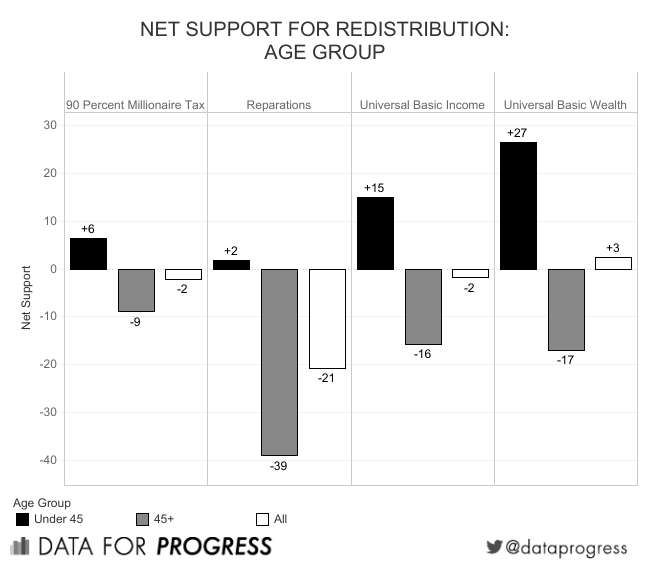 Reparations, a 90% millionaires tax, and universal basic income and wealth all had net support among Americans under 45. In none of these were Americans over 45 even close to supporting the policies. Of course, not all progressive policies are only popular among the young. Our New Progressive Progressive Agenda Project, with polling of likely 2018 voters from Civis Analytics, includes data on a wide variety of progressive issues and found that there are progressive policies that see broad support across demographics. However, even in these instances, young people are more strongly in favor than their elders. Employee governance was the sole policy among those surveyed where the youngest demographic did not also have the highest support for the policy -- chalk that up to the 35-64s having enough time in corporate life to realize the wisdom of worker control. On issues like public housing (50 percent in favor, 28 percent opposed) and free tuition (54 percent in favor, 27 percent opposed) that were modestly underwater among the oldest voters, young people showed consistent and strong support. We all know how this story ends. The writing is on the wall and a true left flank in American politics is emerging. But the question of when it emerges is not a trivial one and voting patterns tell a disturbing story. Every day that goes by under the ruthless oligarchical regime of the Trump administration or even the bloodless centrism of the right wing of the Democratic Party is another day closer to ecological collapse, another day of state sponsored ethnic cleansing, of pharma executives making millions while people die of preventable diseases. Jason Ganz (@jasnonaz) is a senior adviser at Data for Progress. Sean McElwee (@SeanMcElwee) is a co-founder of Data for Progress. The gender gap in party affiliation is a well-documented phenomenon. Women tend to identify as Democrats and vote Democratic more often than men and men tend to identify as Republicans and vote Republican more often than women. The trend is relatively consistent across time and across data sources (for more, see the Pew Research Center, FiveThirtyEight, and Alexander Agadjanian’s recent blog post on Data For Progress). Recent polling conducted by Data For Progress and YouGov Blue shows that this gap is also present examining support for progressive policies. While there is encouragingly high levels of support for a variety of progressive policies, men are also less likely than women to support progressive policies. The figure below shows estimates of male and female support for various progressive policies. For each of the ten policies, men are more likely to strongly oppose or disagree than women (high definition chart). There’s evidence that this gap is driven in large part by the views of white men in particular, as Sean McElwee wrote in another recent Data For Progress blog post. But the gender gap also holds up across education and age lines (high definition chart). Below, I analyze support across gender and education, and analyze the share strongly disagreeing with the policy. This gives a sense of the intensity of opposition. Notably, on issues related to inequality and race, we see some of the largest gaps (defunding ICE, 90% tax rates, universal basic income, baby bonds and reparations). Examining across age and gender, I find notably that young people are much more progressive on almost every issue included in the survey, and young women are less likely to disagree then young men. There is no issue for which more than 20 percent of young women express “strong disagreement" (high definition chart). The growing gender gap in partisanship is also reflected in policy preferences. Even though most of these issues haven’t been heavily paritsanized, we still see large and consistent gender gaps, with women less likely to express strong opposition to progressive policies. Anthony Rentsch (@Anthony_Rentsch) is a data analytics fellow at Catalist. Based on Data for Progress (@DataProgress) / YouGov Blue polling fielded between July 13 and 16 with 1,515 voting eligible adults, weighted to be nationally representative. See question wording and more data analysis here.